Rock Story in Montreal or Quebec City? Inform me about the next events for Rock Story. Enroll yourself to our priority waiting list for Rock Story to be alerted when new tickets are available. Filling this form doesn't engage you to any purchase. 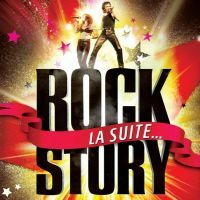 The musical review Rock Story has been running all over Quebec for more than 10 years. Jean Ravel and Elysabeth Diaga never stops to amaze us by their perfomances. Contact our ticket office for more information on our available tickets.